A typical Zafon - hard to put down, easy to fall in love with. If you’ve never ventured into Gothic horror before, then this is a fabulous place to start. 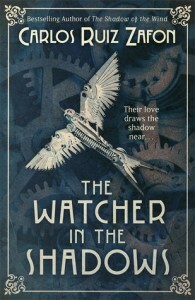 If you have and you’re a fan, then ‘The Watcher In The Shadows’ deserves a place on your bookshelves with the best Bronte, Hill and Shelley.